If you’re new on the blogging scene, talk of the best content promotion strategy is probably not an entirely foreign topic to you, even at such an early stage. Any quick search will yield awesome guides like this. Problem is, it’s all from an advanced blogging perspective—nearly all those searches!—how to break that next ceiling of followers, get your content in the right hands, all assuming that you’ve been at it for a while and need a nudge in a different direction. This, on the contrary, is for all the blogging newbies out there, potentially overwhelmed and unsure of where to start. At one time, not long ago, I was in your position, too. I started to rifle through the pages upon pages of those same guides, trying my damndest to absorb the information of a world I had only begun to be exposed to. My eyes started to glaze over. I felt like I was getting in over my head. So you’ve set up a blog. You know what makes a good blog tick. You’ve started experimenting with attracting attention from your target audience with those posts on such social channels as Facebook, Twitter, LinkedIn, or even Snapchat (guilty!). Or, if you’re a little ahead of the beginner’s game, you might even be optimizing those posts for search engines. You’re off to a great start. But that’s all it is—a start. This beginning cannot be the entirety of your content promotion strategy. You want each blog post to be shared, repurposed, packaged up differently, and working as hard as it can for you as an essential gear to keeping your content marketing machine functioning as it should. Why is a content promotion strategy essential? b) You are competing with the entire internet. (It’s true! Blah blah blah billions of pieces are created and shared everyday. Exact statistic.) All jokes aside, it’s intimidating. The days of “write it and they will come” just don’t apply now. The sphere is too damn saturated. So you’ve got to position a kickass content promotion strategy, or you, like many well-meaning marketers before you, will be lost to the content marketing sands of time. Alright, now are you with me? Let’s get started on this promotion strategy of yours before any more time is lost and innocent content left to perish. 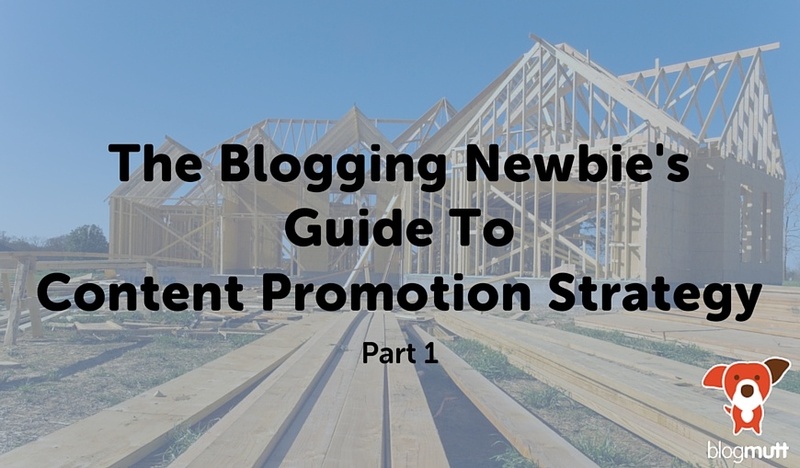 What does a successful content promotion strategy for blogging newbies look like? Okay, okay, sounds obvious, but you’ve actually got to HAVE content to send out into the content marketing ether to begin. Whether that’s a blog post, an infographic your designer whipped up, or a quick Snapchat video, that’s a worthy piece to share, as long as it provides value to the reader. Think: Would I read/watch/engage with this if I came across it by chance? Is it actually helpful? Or, perhaps we should take one more step back: Who is your audience? Do you know? Targeting a 13-34 year-old demographic? Snapchat’s your bet. Or, are you targeting professionals in your industry who get a lot of their news from LinkedIn? Research and tap into the power of LinkedIn Groups and getting your content on Pulse’s radar. It might require asking for some model cases of how a few ideal customers/clients found you in the first place, and where they are most likely to go for trustworthy, actionable information from experts in the industry. Forums like inbound.org or growthhackers.com? Email newsletters? Social media, and if so, which channels in particular? Product review sites? Medium, or other blogs? Partnership directories? Conferences? Podcasts? YouTube? Organic search? With some elbow grease and asking enough of the right questions, you’ll have a direction where your efforts (and budget) will be best purposed to get the target audience the information that they need, when they need it. After all, you won’t know what’s successful if you have nothing to measure against. Behind every great marketer is a host of reports, metrics, and stats to justify efforts and dollars. Google Analytics is the perfect place to establish and keep tabs on all of it. This post will get you all set up. Don’t neglect this step. If a tweet didn’t land or that blog email newsletter didn’t receive the open/click rates you were hoping for, perhaps it would be better cooked and served up as an infographic, SlideShare, presentation at a conference, webinar, series of blog posts, or a one-pager. Sometimes it’s not the content itself that’s lacking, but rather the form in which it’s presented. Stay flexible and always thinking about what your readers want and need when it comes to repurposing content. Mix it up! What you’re putting out might not be 100% what resonates best, despite your best researching efforts to understand your demographic. What might that look like? A/B testing images in posts, using gifs and brief videos, trying different versions of subject lines on emails, incorporating punchier headlines on blog posts, posting on social media channels at off-times of day or on weekends. Heck, even adding a few new hashtags to each tweet could make the difference to move the needle. It took us several months of diligent blogging and posting to social media multiple times a day to finally get traction and more eyes on the blog posts we had been working so hard to write. Content marketing is truly a marathon, not a sprint. The good news is, no matter what, that blog posts will still perform for you on organic search, even if no one is technically reading them. Keep at it, because that consistency is key, and stay patient. Enjoy the process and document your successes and failures. Everything you try will inform what that successful content promotion strategy will look like at the end of this. In Part 2 of this post, we’ll up the ante and start talking about more advanced content promotion techniques now that you’ve got these initial six under your belt, like guest blogging and influencer marketing. There’s plenty more to learn, but this is more than enough to make a newbie dangerous (and definitely no longer drowning in the sea of content marketing! ).